Today I found this 2007 quarter without D . G.
Last edited by jello on Wed Sep 04, 2013 6:53 am, edited 1 time in total. Re: 2007 Curling Quarter without D.G. That's the wheelchair curling 25c struck to commemorate the Paralympic Games. There were two. The other is the 2009 sledge hockey quarter. Note the little emblem and text on the obverse. At the same time a 10 coin series came out depicting winter olympic sports. On those the obverse was identical (Godless) to yours except for the logo being of the Vancover Olympics instead of the Vancouver Paralympics. 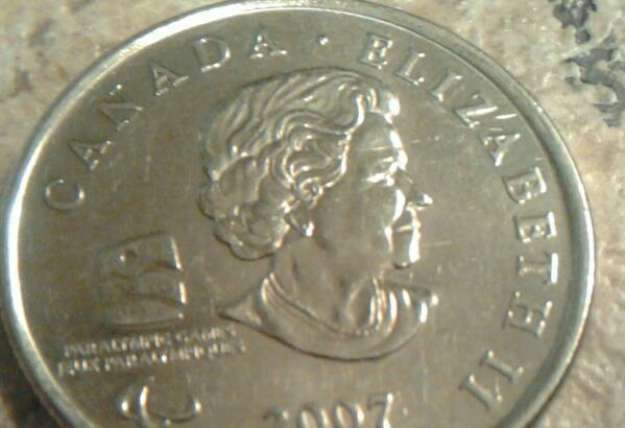 In addition, the 2009 Cindy Klassen quarter (speed skater), and the Men's and Women's hockey quarters were also Godless, but of an altered obverse design. Other than the 2-bit 1911, I can't think of any others.